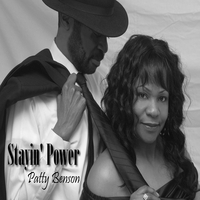 Stayin’ Power, a new single by Patty Benson. This song has a serious beat with vocals to match. Wish I could listen to more, but the demo is short. If I get a chance to meet Patty Benson, I love to jam with her band someday before I retire from the music business. She is one of America's best kept secretes and I am glad I came across this site by acident. Keep putting out music like this and you'll be on stage with BB King someday! I love it!!! This is definitely you Patty!!! Love you Girl!